Google believes technology can make a better world, faster. The Google Impact Challenge supports non-profit innovators using technology to tackle the world’s biggest social challenges. We create a a digital campaign to create awareness and increase user participation via a microsite and SNS engagement. Everybody can have a positive impact on the world by voting for the best ideas that makes the world better faster. 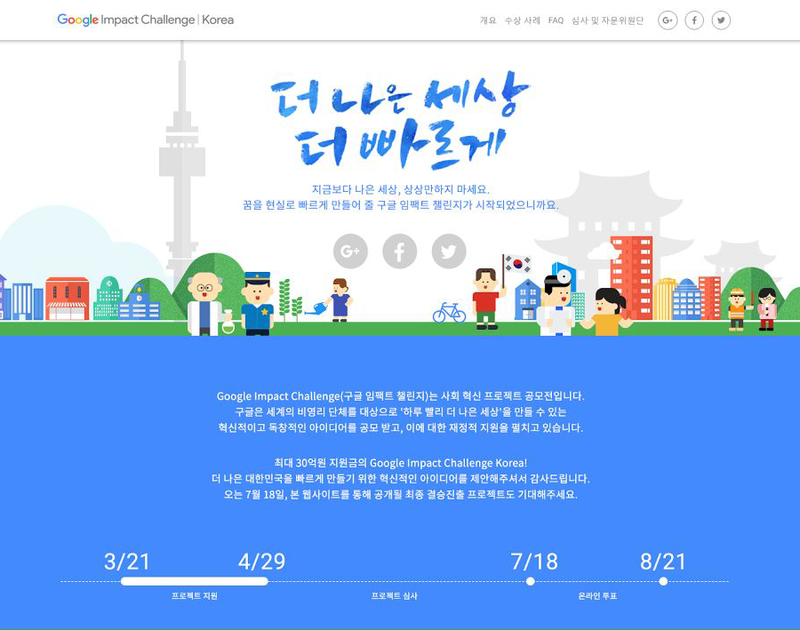 We created a unique localized CI for the “Impact Challenge” in Korea. We designed a “Googley” character design that resonates well with the fast and mobile driven Korean pop-culture. The characters are used to explain the previous winning and the new submitted idea. The characters animated users to join the challenge and participate in the Impact Challenge voting process. They catch attention in a country that is highly influenced by emoticons and mobile chat app stickers and guarantee a higher social share-ability for the campaign social postings.